Xiandi Chua ruled the girls 200-meter backstroke event in the 16-18 years old category on Saturday to capture her second gold medal in the 42nd Southeast Asia Age Group Swimming Championships here. The 17-year-old Chua clocked two minutes and 21.98 seconds to beat Indonesia’s Azzahra Permatahani, who registered 2:22.41. Thailand’s Fonpray Yamsuan took the bronze medal in 2:23.14. Chua, a Grade 12 student at the Immaculate Conception Academy, also collected a silver in the 400-meter Individual Medley event. The 5-foot-6 Chua submitted 4:57.50 to finish second to Permatahani, who won the gold in 4:53.17. Vietnam’s Mai Thi Linh Linh settled for the bronze in 5:01.83. Chua delivered the country’s first gold on Friday when she topped the 200-meter Individual Medley event. She also earned a bronze medal from the 4×200-meter freestyle relay event. Brosas, who has been training Chua since 2016, said the immediate goal is to qualify in the 2019 Southeast Asian Games, which the Philippines is set to host. “She will continue her training at Philsports (Pasig City) after this tournament and next year, there is a plan to send her to Australia for further training,” said Brosas, who has trained Olympians Eric Buhain and Akiko Thomson. 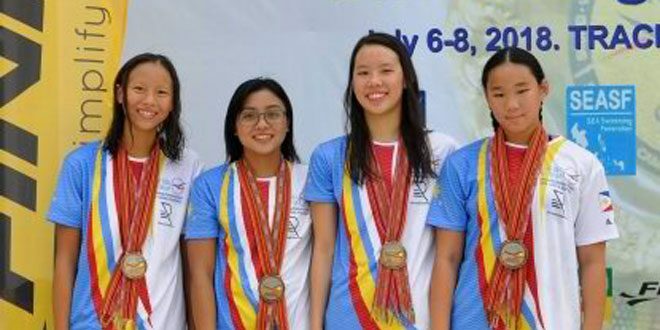 Meanwhile, US-based Miranda Christina Renner and Mishka Sy contributed to the country’s gold medal haul in Day 2 of the tournament organized by the Philippine Swimming Inc. (PSI), which is headed by Lailani Velasco, and supported by the Philippine Sports Commission (PSC). Renner, who was born in Manila to a Filipino mother and an American father, registered 28.23 seconds to pocket the gold medal in the girls’ 50-meter event in the 16-18 years old category. She bested compatriot, Regina Maria Paz Castrillo (28.36), who won the silver while Indonesia’s Adinda Larassati Dewi got the bronze in 28.48. Sy, a MILO Little Olympics standout, won the gold in the girls’ 200-meter backstroke event in the 13 years old and under category with a time of 2:27.34. Thailand’s Jinjutha Pholjamjumrus took the silver in 2:27.51 while Indonesia’s Komang Adinda Nugraha clocked 2:28.13 for the bronze. Aside from three golds, the Philippines also managed to win five more silvers courtesy of Jonathan Cook (boys’ 100-meter breaststroke, 16-18 years old category), Jalil Sephraim Taguinod (boys’ 100-meter breaststroke, 13 years old and under category), Philip Joaquin Santos (boys’ 200-meter backstroke, 16-18 years old category), Rafael Barreto (boys’ 50-meter butterfly, 16-18 years old category) and Ted Jacob Laminta (boys’ 400-meter IM, 14-15 years old category).